Powerful, chubby and happy ET cluster - a floater - is over half of a pound and 2 1/4x 3". A large, 3/4" shallow space of natural damage is already regrowing. 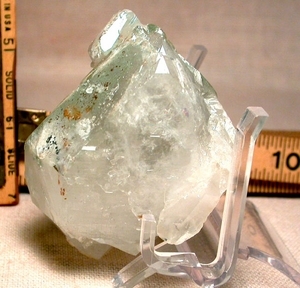 There are chlorite inclusions of varying color from sand to deep green, many glyphs, rainbows and record keepers. Penetrators range from 1/8" to a 3/4" tabular twin highlighted with a rare and vivid multi-colored iris. Various faces have elestial regrowth and parallel growth; clear areas offer you views in between the veils.